EXPLORE NEW WAYS TO IMPROVE YOUR COMMUTE! 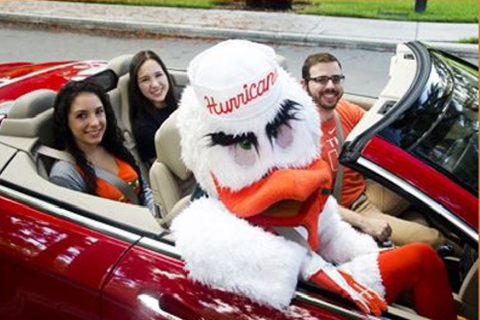 RideFlag, the University's official carpool mobile app, provides carpool matches in real time and allows you to schedule future carpool rides or ride with a fellow 'Cane. Upgrade your parking permit color zone (subject to availability) when using the RideFlag mobile App. Upgrades are NOT available in Reserved, Restricted, Service, and Visitor parking spaces. Receive 6 emergency ride home vouchers. Save money by sharing your commute cost. The RideFlag program is available to full-time and part-time students, faculty, and staff. You may use the vehicle of the permit holder or any other rider's parking permit. If the rider does not own a UM parking permit, you MUST complete this form and submit to the Parking Office in order to register the rider's vehicle and be eligible for the color zone upgrade. Download RideFlag at Google Play or Apple Store. You will be prompted to complete your personal profile using your UM email credentials. Once registered, you may review the list of carpool matches and you can call, text, or email for carpool confirmation. You and other carpooler(s) set up your meeting time and location. All information is kept confidential. Enter your destination and get instant carpool matches or schedule future rides. Decide whom you ride or drive with. A valid UM parking permit is required. In the event of Emergency? Make sure you enroll in the Emergency Ride Home (ERH) program through this link and receive 6 ERH vouchers when you register your carpool. For carpool renewals click here.